For a WooCommerce store owner, it's highly unlikely to progress without having data on his web traffic and conversions. Conversion data are the determining factor in making a site progress. A small business aspirant has just opened up a WooCommerce Store for a highly-demanded novel segment, athletic footwear users. He is getting scores of visitors signing up from his local-hood, the site is multilingual, and the products offered are superb. Everything's fine and dandy at the start. After running his site for a couple of months, he realizes from web analytics services, such as, Google Analytics, that his most crucial pages are not attracting visitors as they should, sales have stalled, and he is not effectively targeting the right customer segments. He also wants to target potential customers through his existing Facebook and Twitter pages from where he derives most of his customers. But he has no medium to do this. What's the best solution for him? He understands to be able to overcome this he needs to pass conversion data from his WooCommerce store to the right channels where he can run paid ad campaigns to bring in more people to his site. To be able to do this the store owner needs to retarget visitors through the channels that work for him in order to promote his business to the right people. This he can do simply using a FREE plugin! 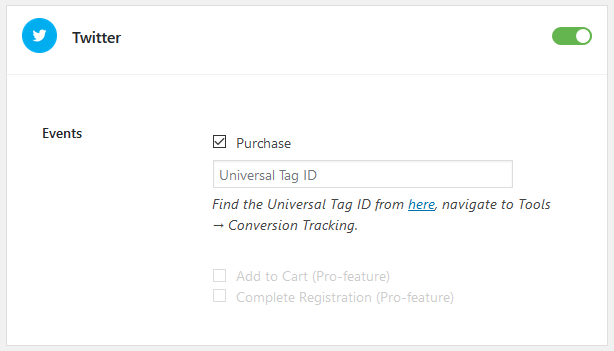 The WooCommerce Conversion Tracking plugin for WordPress sends user-triggered events from your WooCommerce store to your chosen ads platform. This lets you create better retargeting campaigns through those channels. It's straightforward and undemanding. A piece of cake! Marketing and Ad campaigns are very important for any eCommerce business. You can collect adequate and important user behavioural data and send it to different Ad platforms like Facebook, Twitter, Adwords, Perfect Audience etc. Using this data, you can prepare better advertising strategy for these ad platforms. You will need Pixel ID for sending data. But adding Pixel ID is a very complex process for non-technical people like store owners or business managers. WooCommerce Conversion Tracking Free allows you to insert Pixel/Account ID for Facebook, Twitter, Google Adwords easily without any coding. Besides that, you get the following benefits while using WooCommerce Conversion Tracking. You can find new potential customers by targeting and reaching people who have performed certain activities on your WooCommerce store i.e. visited your products, added them to cart, signed up on your store, added products to wishlist etc. Reaching such people opens a new opportunity for your store. The following screenshot shows the Advanced Matching feature of Facebook Ad Platform. If you can feed Facebook with parameters like email, phone, city etc. of your users who have performed specific actions on your WooCommerce store, you can create better ads with targeting those specific people. You can optimize your ads depending on actions triggered on your WooCommerce store. For example, if a user made a purchase from you, then you can send those data to your Ad platform and target those customers who would most likely to buy from you again if they find the previous product or service useful. This potentially drives more sales. The following screenshot shows the data of specific events that has happened on your WooCommerce store. This information can be tracked on Facebook, Twitter, Google Adwords etc. when you can successfully send the data to those ad platforms. This helps you to measure and prepare better ads for increased sales. You can track your ad results and understand the success of each of them. This means you get a birds-eye view of your conversions and sales. Thus, you can find out all the data that you can see from your WooCommerce store. The best thing about this plugin is it requires no coding or coding knowledge. In other words, the plugin is ready-to-use for the average user. Unlike other analytics tools, the user doesn't have to implement tags and codes to every page of the website in order to send client data to the server. WooCommerce Conversion Tracking requires the user to choose the events he wants to track and instantly send this data to different channels where he is running paid ad campaigns, such as Facebook and Twitter. Using these data, the platforms can now retarget those users who have already visited the site and made some actions. The owner can now target people more easily using Facebook Ads and WooCommerce Data. WooCommerce Conversion Tracking plugin's functions will enable the owner to conduct better Facebook marketing for his eCommerce. When a visitor carries out a particular set of actions in the WooCommerce store, he triggers some events the data for which are sent to Facebook. Similarly, WooCommerce Conversion Tracking has a Twitter integration to pass the store's data for several events to Twitter. This allows the owner to retarget users better with Twitter ads. But what if you don't want to use Facebook, Twitter or Google AdWords? 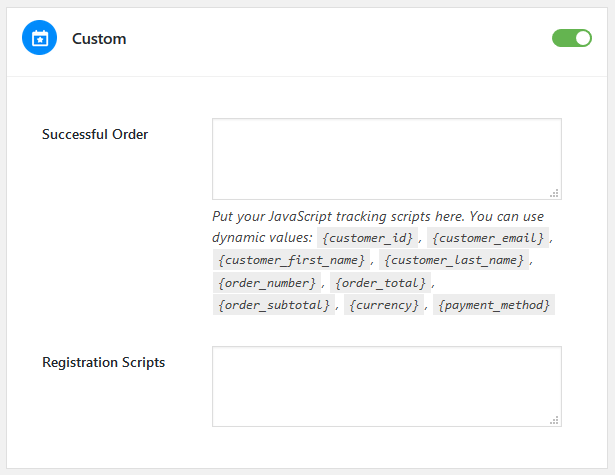 But instead of having to put these tags in every page of your WooCommerce store, simply insert the scripts in the WooCommerce Conversion Tracking plugin, and seamlessly pass your order and registration data to the channel of your choice. The Custom integration setting also allows you to enter dynamic values to track chosen categories. Now that you know the purpose of this solution, get started with it. It's quick and easy to install, saves you valuable time from custom coding, gives accurate information automatically. And above all – It's free! Connect your WooCommerce site and send user-triggered events instantly to your chosen ads platform. Want to Target More Specific Customers and Need More Features? If you are looking for more accurate and precise conversion tracking of your WooCommerce store, you can try the premium version of WooCommerce Conversion Tracking! With the premium version of WooCommerce Conversion Tracking, you can easily connect your store to Perfect Audience. This means you can send your conversion data directly to Perfect Audience for better retargeting. The free version provides support to some basic events that may help you in terms of retargeting. If you want a better result and want to target visitors and users who have performed specific actions on your site (depending on their behaviour), the Premium Version of WooCommerce Conversion Tracking is the perfect solution. You can track and send data of following important conversions. 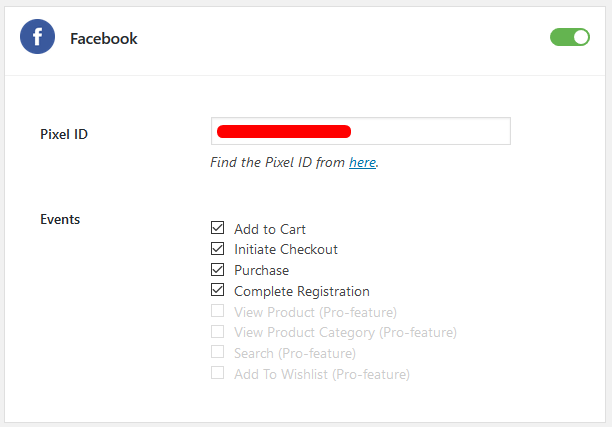 You can target people on Facebook who have viewed your WooCommerce products and product categories. This is a great way to attract customers by reminding them about the product. Besides that, you can target specific users who have searched specific products or added products to wishlists. This is a great way to market and advertise people to have shown interest in your products. In case of Twitter marketing, you can target people who have added your WooCommerce products to their carts or have signed up to your store. 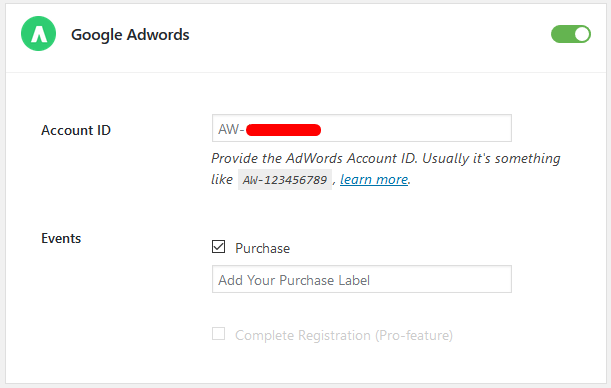 Similarly, you can send data of the people who have signed up on your WooCommerce store directly to Google AdWords. Thus with PRO, aside from Purchase you can track also Complete Registration. If you are a marketing agency or have more than one person handling marketing campaigns, it's natural that you will require multiple pixel support. With WooCommerce Conversion Tracking Pro, you can add multiple Facebook pixels and customize events depending on your requirements. This makes things lot easier, especially if you work with agencies or partners who want to have their own pixel. Or you may have different social media managers who handle different events of your Facebook channel. The Multiple Pixel ID Support comes really handy in such cases! As more than 10,000 people are actively using the WooCommerce Conversion Tracking FREE plugin, we are celebrating this milestone by releasing the Premium version. Also, a promotional offer is going on for a limited time. Enjoy a 50% OFF on all Premium Packages! Need to know if this is compatible with Google Merchant Center. My ads are driven from the Woo Commerce product feed into the Google Merchant Center.